Instructor User Guide Tests and QuizzesWhat is the Tests & Quizzes User Activity Report? This feature allows the instructor to view a list of all assessment submissions for a specific student, including submissions that are no longer available via the Total Scores screen as because the instructor has allowed the student to retake (via "Allow Retake") the assessment. Select the Test & Quizzes tool from the Tool Menu in your site. 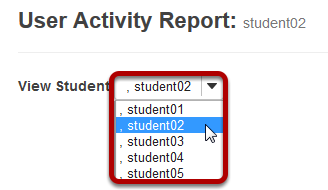 Select the student you want to view from the drop-down list. Zoom: View student assessment activity. The assessment title, id, submit date, percentage, and score/points will be displayed for all of the assessments the selected student has taken. Clicking on the title of the assessment will display the individual student submission. Prev: What is the Tests & Quizzes Event Log? Next: How do students submit an assessment (i.e. test or quiz)?